Turister | Tourists – Just another . . . . . . . . . blog! 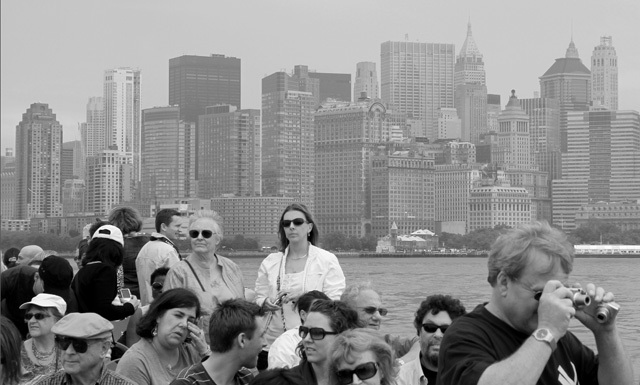 Gotta love a guy clutching two cameras and facing away from the skyline, focusing instead on – who knows? He’d probably been shopping at B&H. Buy one, get one for free! -No not in B&H as far as I remember. Tourist make the world go round. Been one myself many times. And fun makes the tourists go round the world. I liked the way the tourists looked in different directions without looking particularly interested in what they saw. -Except for the two young people. Look at the haze. I didn’t take care of the sun, but it burnt me through the clouds. Both typical and special. It is true that people all looked in different directions following their own interests apart from the young couple who seemed to be more interested in each other 😉 And you, focusing on all that was around you. I like the different shades of foreground and background. The haze ? separating the two. Great moment you captured. Thanks Isabelle. Perhaps you have recognised the young couple.